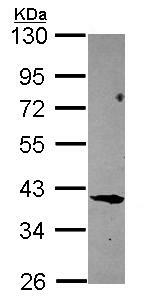 Recombinant fragment corresponding to Human Migfilin aa 171-373. 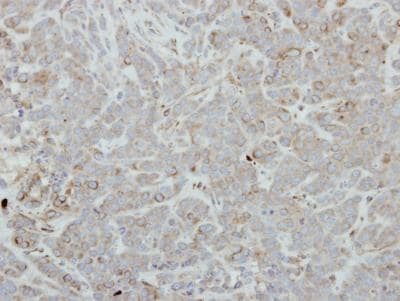 HCT116 whole cell lysate; Human MDAMB231 xenograft tissue. Our Abpromise guarantee covers the use of ab154417 in the following tested applications. Serves as an anchoring site for cell-ECM adhesion proteins and filamin-containing actin filaments. Is implicated in cell shape modulation (spreading) and motility. May participate in the regulation of filamin-mediated cross-linking and stabilization of actin filaments. May also regulate the assembly of filamin-containing signaling complexes that control actin assembly. Isoform 1 and isoform 3 are expressed in heart, kidney, lung, pancreas, placenta and platelets. Isoform 2 is expressed in brain, heart, kidney, lung, pancreas, placenta, skeletal muscle and platelets. Cytoplasm > cell cortex. Cell junction > focal adhesion. Cytoplasm > cytoskeleton. Associated with actin stress fiber at cell-ECM focal adhesion sites. Isoform 1 and isoform 3 are recruited and localized at actin stress fibers and clustered at cell-EMC adhesion sites through interaction with PLEKHC1. Isoform 2 is localized at actin stress fibers. Immunohistochemical analysis of paraffin-embedded MDAMB231 xenograft labeling Migfilin with ab154417 at 1/250 dilution. ab154417 has not yet been referenced specifically in any publications. Publishing research using ab154417? Please let us know so that we can cite the reference in this datasheet. There are currently no Customer reviews or Questions for ab154417.